The ITER Project is the largest fusion research collaboration in the world. 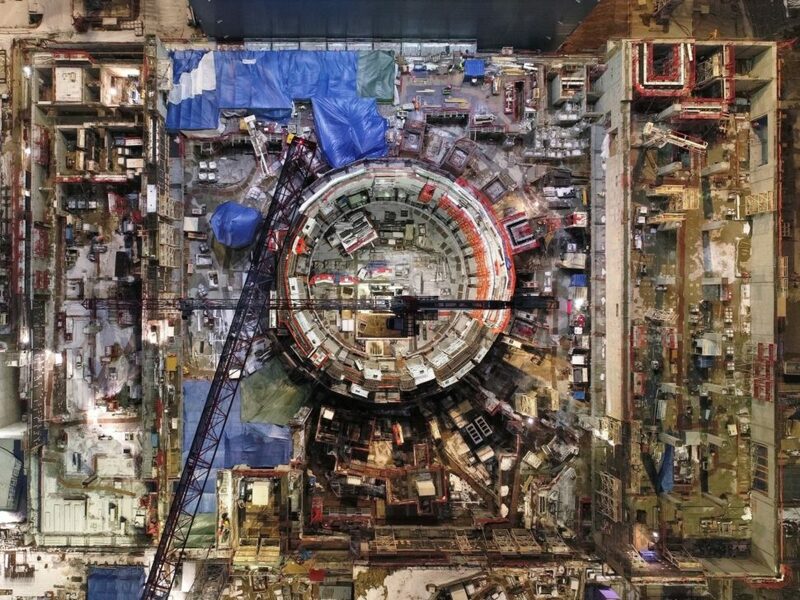 The complex has entered its first phase of assembly, and the ITER reactor is expected to deliver its First Plasma by December 2025. If successful, it could provide free energy to the entire planet. The ITER Project, the world’s largest fusion reaction research program, is on track to make fusion power viable. There are different states of matter in the Universe. We also know that they can change from one state to the next according to the amount of energy available. Under heat, a solid will pass to the liquid state. With more heat, it then converts to the gaseous phase. If more energy is applied, atoms in the gas ionize. That is, they lose some electrons and become ions which makes plasma, the fourth state of matter. You may be surprised to know that plasma is everywhere. Over 99% of matter that makes up the known universe is plasma. It should be no surprise then that plasma is a key ingredient for nuclear fusion. Read More: Why is no one Talking About LENR Cold Fusion? Here on Earth, plasma can naturally form and it’s more common than we might think. Fire is plasma, as is lightening and polar aurorae. Even the gas in neon tubes is a form of plasma. The Sun is an 860,000-mile-wide plasma reactor that, in a process called nuclear fusion, has been churning hydrogen into helium for billions of years. The nuclear fusion reactor inside the Sun burns millions of tons of hydrogen every second. While most get converted into helium, the remainder becomes pure energy. In the Sun’s core, pressure and temperature become so incredibly high (10-15 million degrees Celsius) that the nuclei of atoms separate from the electrons. Positively-charged atoms (ions), and negatively-charged electrons form plasma where nuclei and electrons roam freely. Light nuclei can bind together to give birth to heavy nuclei. When this happens, they release huge amounts of energy. Thanks to nuclear fusion, in a single hour, the Sun can provide enough energy for the world to run for a whole year. Just to clarify, that’s only the sunlight that reaches Earth and not the total energy output of the Sun, which is obviously much greater. We’ve been harnessing raw solar power for a long time and we’re always looking for better ways to harvest and store it. However, if we can replicate and downsize the Sun’s power mechanism to an industrial scale, it would be a real game-changer for humanity. There’s a six-decade-long theory that backs nuclear fusion and its promise of near-limitless energy. Practical steps are being taken to investigate the technology’s industrial viability. In the future, thermonuclear reactors (one famous iteration is known as a tokamaks) could power the world, but scientists and engineers are laying the groundwork for them now. Signs of progress in this area are announced here and there, often with buzz, but maybe we should take some with a grain of salt. It’s not that they’re not serious, it’s just that sometimes the press (and occasionally researchers) can get ahead of themselves in their findings. That said, there are advanced projects that benefit from the support of prestigious research institutions and major companies. MIT’s SPARC and Lockheed’s project are two such examples. However, there is still a long way to go before we get to operational nuclear fusion plants. The ITER Project, currently under construction in France, is the largest fusion power project that benefits from huge resources. The acronym ITER used to be interpreted as the International Thermonuclear Experimental Reactor, which is still the case, but now it’s also referred to by its Latin meaning: “the way”. The ITER Organization is funded by 35 countries, including the U.S., which just reaffirmed its commitment to the project by doubling its in-kind contribution for the year. Signed in 2006, the INTER project agreement continues to be on track with the organization recently announcing that 50% of the work on the project was complete. As the 180-hectare facility is prepared, the equipment, components, and techniques necessary for the ITER’s tokamak to run are steadily coming in. The complex has entered its first phase of assembly, and the ITER reactor is expected to deliver its First Plasma by December 2025. If the ITER project succeeds and other initiatives ensue, we could have an infinite source of clean energy, the same that powers the stars and made life on Earth possible in the first place. Do you think the ITER project would deliver on its huge promises? Thanks for keeping us posted Steven! Very interesting stuff.